Velstadt defends King Vendrick's tomb inside the Undead Crypt. A clerical knight from a faraway land who was lured to Drangleic, but forgot why he came. Sir Velstadt was always at King Vendrick’s side, as if he were his Lord’s own shadow. Velstadt and his fellow knight Raime were known as the right and left arms of King Vendrick. That was until their wills clashed and they fought. Velstadt defeated Raime and Raime was deemed a traitor. The exiled Raime left in search of greater power and the Royal Aegis remained at his post. After the King retired to the Undead Crypt, Velstadt followed, never to return. The knights in his service waited patiently for his return, until they eventually turned to stone. Within the Undead Crypt, Velstadt and his armor, originally imbued with the power of miracles, was soaked with Dark after extended exposure. His great hammer, seems to have been most powerfully blessed, as the blessing had not faded completely, despite being exposed to the Dark of the Undead Crypt. In the end Sir Velstadt, known as the Royal Aegis, gave himself to the King in both life and death. Countless dead rest in the Undead Crypt in peace, cradled by the comfort of dark. Light only agitates, and there is no need for it there. Velstadt, along with his Royal Guards have put to death many castle servants and the like who have come to fetch King Vendrick, following their King’s order to the last. Velstadt is an especially interesting character because of his clerical qualities. His armor is imbued with the power of miracles while his weapon carries a powerful blessing and is described as sacred. 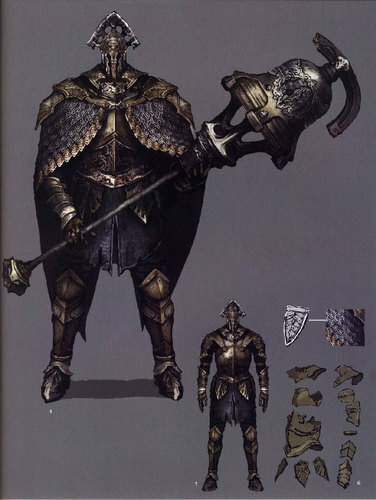 His appearance resembles Garl Vinland (a cleric knight from Demon’s Souls) and his hammer that of Paladin Leeroy from Dark Souls. These things are clearly meant to imply that Velstadt was a cleric, a believer in the Age of Fire, one descended from the Way of White. But from what we read about Vendrick, it is made clear that Drangleic was not a place for a cleric with any ambition. 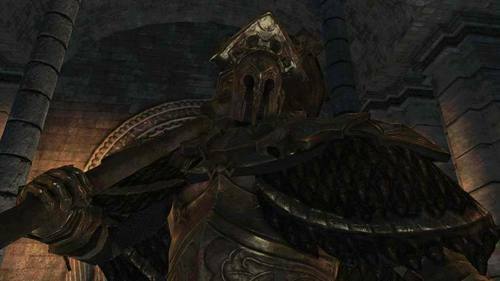 Clerics of Drangleic were not viewed with particular reverence, and their positions were only preserved as a nod to tradition. What was this tradition? The order of bishops and priests came from the Way of White. This covenant was invented by Gwyn and perpetuated by his uncle, All-Father Lloyd. The Covenant was interested in the continuation of the Age of Fire, and may have had clear distinction between the roles of men and women (as there is an Ivory Talisman that is only given to women in Dark Souls 1). This information gives us a lot of potential answers. King Vendrick held a lukewarm opinion of the clerics because he was a Dark Lord. He had never taken the true throne, rejected burning himself upon the First Flame and sought any means necessary to end the Curse outside of re-enacting this First Sin. With Nashandra at his side, his Kingdom had embraced the Dark. So what place could clerics who seek to preserve the Age of Fire have in Drangleic, a kingdom that had removed the Firekeepers from their roles and left the flames to die out? They were there simply as a nod to tradition, kept only as attendants to ceremony. Clerics were kept at an arm’s length from the Royal Family and yet, we know that Velstadt was known as his right arm, always found at his side, giving himself to the King in both life and death, almost as if he were his Lord’s own shadow. What is the reason behind this? From appearances it would seem that Velstadt’s and Vendrick’s ideologies were fundamentally in opposition to each other. Was Velstadt so trusted because he distinguished himself in the service of King Vendrick, staking his every battle on strength alone? Perhaps it was a shared burden that brought them together? We know that Vendrick fell to the Curse, and it would appear that Velstadt was afflicted as well. His descriptions speak of him being lured to Drangleic from a faraway land, and forgetting why he came. This almost exactly mirrors the story of the countless Undead that wander Drangleic today, seeking the land's special souls to mend their ailing minds. Velstadt may have never left the King’s side, trusting his every decision, because he believed in the King with unwavering faith, that Vendrick would be the one to find a cure to the Curse and save them both. But in the end, Vendrick’s efforts were in vain. After ordering his Royal Aegis and Royal Guard to put to death anyone who came after him, Vendrick went hollow. Velstadt quietly remained, awaiting any who might seek the King’s company, a knight filled with purpose following a long gone king. 1. Elana, the Squalid Queen is able to conjure up a sort of 'false' version of Velstadt in the boss battle against her. This may be an ability shared between the Sisters of Dark, that Nashandra utilized. It may also be because Shulva is closely associated with miracles, and therefore it is implying that Velstadt came from that land. 2. Velstadt is referred to as a shadow on two occasions. The game seems to make a pointed reference to this. 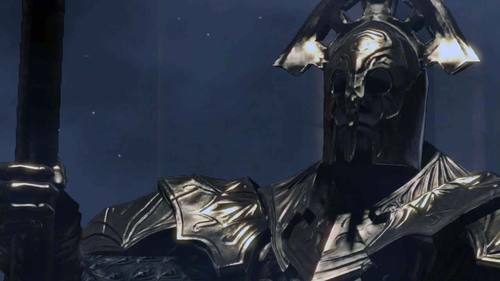 It could be because, in the same way that a shadow follows anyone in the light, Velstadt was metaphorically his Lord's own shadow. There may be multiple reasons he is referred to as a shadow, most likely because of the close relationship he had with the King (never leaving his side) and perhaps because his soul was eventually corrupted by the Dark. When his soul became corrupted is actually not confirmed. We know that his armor and weapon were exposed to the Dark, but his soul is never specifically said to have been exposed. Interestingly, Velstadt's soul and Raime's are both steeped in Dark. We can be all but certain that Raime's became this way because of his proximity to Nadalia, Bride of Ash, so what does this imply about Velstadt? 3. Chancellor Wellager gives us an interesting line regarding Nashandra: "Long ago, the Queen came to us, alone, from a faraway land". This becomes more interesting when we compare it to Velstadt's armor descriptions: "A knight from a faraway land was lured to this accursed land". Both of these beings were said to have come from a faraway land, could this simply be a coincidence? There is certainly evidence against this theory, but it is interesting to speculate.